where, $q_i$ and $q_j$ are the electronic charge on the particles, $e$ is the charge of the electron, $\varepsilon_0$ is the dielectric permitivity of vacuum, and $r$ is the distance between the two point charges. The Python code below defines a function that models the electrostatic interaction using Coulomb’s law and plots it. The above code and plot can be thought of as the interaction between a sodium ion (Na+) and a chloride ion (Cl-). These ions have opposite charges and therefore will be very strongly attracted to each other. 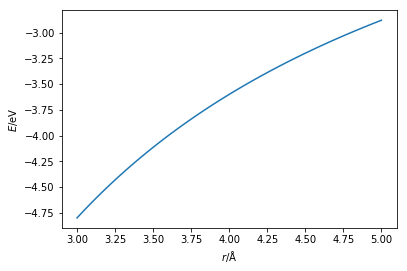 The above plot shows that the interaction is always attractive. However, if this were the case oppositely charged atoms would collapse into each other. This appears to be the case because we must also consider the van der Waals interaction that is present. 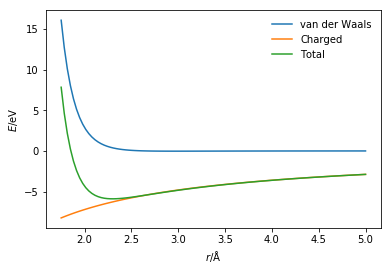 This means that to determine the total potential energy for the Na+ and Cl- interaction we must consider the sum of the van der Waals interaction (modelled with the Lennard-Jones potential model) and the charged interaction (modelled with Coulomb’s law). The presence of the van der Waals interaction introduces the Pauli exclusion principle stopping the unphysical collapse of the two ions. Coulomb, C. A. Histoire de l’Académie Royale des Sciences 1788, 569–577. Coulomb, C. A. Histoire de l’Académie Royale des Sciences 1788, 578–611.